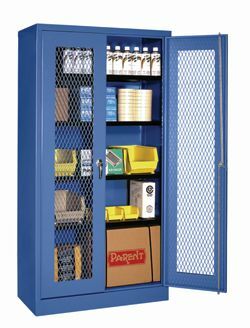 Excellent cabinet when security, visibility and ventilation are important. All units are shipped set-up & ready to use. Features expanded metal door fronts for quick content identification and air circulation. Doors are 16 ga. with full height piano hinge. Shelves are 18 ga. with 400 lb. capacity each - adjustable on 2" centers. 3 point locking device with plated locking bears. Includes 2 handles with keys - 1 locking, 1 fixed. Durable Light Gray and Blue powder coat finish -- please specify. FOB Shipping Point.